Antiques challenge. In their penultimate leg, Charles Hanson and Margie Cooper start off in Nottingham and make their way towards an auction in Lincoln. It's the nation's favourite antiques experts! With £200 each, a classic car, and a goal - to scour for antiques. The aim, to make the biggest profit at auction but it's no mean feat. This is Antiques Road Trip! in the company of delectable antiques experts, Charles and Margie. -You're a little bright spark! He's full of advice too. -Be yourself. Live the dream. -And make sure you don't win. I...you know, always think about what you're looking for. Like yourself, you're in good condition. You're of a certain quality. You are becoming that fashionable lot, Margie Cooper. I don't know whether to be flattered or offended! Margie Cooper is playing catch up on this road trip. -I feel like I'm going to break it, Mike. auctioneer and bright spark Charles Hanson. you need your mates with you. Our duo set off on this road trip with £200 each. After three trips to auction, Margie has £325.74. in the Leicestershire town of Melton Mowbray. and will end their week in Leicester. and will make their way towards auction in Lincoln. -This is the River Trent. -that must be the forest where Robin Hood hung out. He's going to be in there, is he? You are the current, present-day Maid Marian. And I can be your Robin Hood. That would be a sight to see. Ha! Let's see what riches our experts can uncover in Nottingham. -Look at this! It's amazing! My jacket's off, Margie. -Can I go for a wander? Is that OK? They're on top form this morning. Oh, look here. Let's see if he growls. He sounds like a flock of sheep! Lordy, you need a mouthpiece. Now, what's this box? And it says Derbyshire Shrievalty. Something to do with the Sheriff's office or something? And it's £29. What else has caught Margie's eye? That's really nice. Lovely bit of Art Nouveau silver there. With that lovely Art Nouveau lady at the bottom. I mean, that could be replaced quite easily. £69, Art Nouveau, 1910, very, very nice indeed. Time to speak to assistant Lynn. It's verging on rude if I said £35. Right, we'll give it a go. Isn't that a pretty shape? There's one word I've got for that. And it's what I would call the Art Nouveau. That's a lot of words, Charles. These Chantilly sprigs are printed rather than being painted. That's quite nice. Condition? Oh, what a shame! What a shame! There's a chip on the inside of the rim. Oh, dear. But it is so stylish. And it's made in Limoges. that has lent its name to fine porcelain since the 18th century. This sugar box dates from around 1910. Only £10, it's not expensive. Could be a fiver. He likes to run up, he likes to run down. Best find salesmen Tony, then. It's priced at a tenner. -I wonder whether you could do it for £5. -Lovely. I'm going to take it. Well, that was worth the jog downstairs. A first purchase of the day and the battle has begun. -I've always liked gnomes. He is early, Margie. Very nice. -Would you like me to make an offer? Oh, he's nice! -It is not very early. -they are quite early and he's an early one. -I was having a joke. I picked him up and realised he was old because he's so badly painted. -But you're not a gnome collector, are you? Where was it, Margie? I never saw that. I didn't think we'd have to separate this pair over a gnome! I don't really want this guy. I was having a laugh with Charles, really. And I thought he was brand new. But he's not brand new. what Lynn can do for the box and mirror. Ahem, ahem! Don't forget old ugly mugs. You're never going to sell that, are you? You'd need a real mug punter to buy that. It's just that I happen to like gnomes. £69 and throw him in. -A cracking haul for Margie. Three items in her first shop, all for £69. He is visiting an imposing building with a bleak history. was created to tackle one of the biggest problems in Victorian Britain. -Hi, Charles. Pleased to meet you. and it was to house the destitute in society. and poverty was regarded as an unavoidable part of life. thing preventing the poor from being left to die on the streets. created a crisis and a new solution was required. Some believed charity should be made less desirable. and Southwell was part of the social revolution that emerged. and this was to be different. help in their own homes to being compelled to come into a workhouse. This was the only choice. Beecher's idea meant that hand-outs were no longer provided. and made to work in return for food and shelter. This significantly reduced the cost of looking after the poor. destitute would be willing to go there in the first place for help. you would ever make as a family, because you were separated once you were in. were divided by gender and then into those able and those unable to work. Each group was kept separate at all times. It was a harsh life, with real rules and regulations. Is that what Beecher wanted? Was he behind the poor and looking after them? that potentially had nobody else to look after them. This building was designed to hold around 160 inmates. there were hundreds of thousands of workhouse inmates across the country. of the workhouse was the only thing that would keep them alive. Gosh, I mean...that's not very comfortable at all, is it? and thought, "Is this my life?" did add warmth, but it's not overly nice, even against my rough hands. And it was better than a hedgerow, I should imagine. of the inmates, but it also generated income. the inhabitants could be subjected to backbreaking physical labour. while others would break up rocks to sell for road building. the fibres from ropes to be recycled and sold on. This was the price paid for basic food and shelter. It was a form of welfare. and a home for those that had no alternative. and all other forms of poor relief were abolished. Over time, they became feared and hated places. that these brutal workhouses, that were once viewed as revolutionary, were finally brought to an end. This looks just the job. -Terry, I must say, how great to see that. The old-fashioned sign for an antique shop. Ah, yes. The barber's pole of the antiques world. -And you. Margie, and you're Terry? Introductions over, what takes your fancy? -I see you've got lots of nice shiny stuff. -Yes! I like my silver. -There is a little piece there that is a Victorian. But I can't see a price there. Oh, here we go! Time for a closer look, Terry? See, we've got that, we've got that on at £59. You'll get that at £59. Absolutely cracking nick, late Victorian. -What a lovely thing to give somebody for a gift, eh? I'm trying to find the mark at the moment. Oh, yeah. Oh, God, that's nice. Nice little Chester hallmark. That's really nice. Right, OK. That's a little start. And I'm going to start having a little wander, if I may? I'll always do a price for you. I'm well known for it. Aw, Terry, that's really nice. Two feet from the till and Margie's got her eye on some silver. Anything else? Right, let's just have a look. This looks quite nice, doesn't it? I think the base is rosewood. A different top to how it started life. The ticket price is £65. you've got to have the right top with the right base. -Oh, yeah. One to think about, then. They are, I believe, from 19... Well, First World War, 1914. I think they're called sweetheart cards. back home to their loved ones. These are dated from the First World War. -They haven't been written on. -So you bought them as a collection? Yeah, yeah. Some people prefer them to be written on. -Oh, my goodness me. A little bit dramatic, aren't they? -Why not? It was dramatic times! It was, yeah. So how much are those, Terry? -Well, it's £25 for the whole lot. -Doesn't sound a lot, does it? -I don't think it's a lot. -I've also seen - in the other room - the little table. -Maybe we could go and look together? -Yeah, yeah. Have a look. Got something in your eye, Margie? So it's on at 65, I believe. Yeah, which is, you know, you'd be lucky if it gets that. 90, and they're all yours. And just like that, Margie polishes off a very productive day. -It's another day and another county. We're shopping in our great country. Charles is hopping out to Navenby to visit his first emporium of the day. -Pull in here, Margie. Thanks, Marge. See you later. -Good morning, how are you? Do you know, I was about to say, it looks vaguely familiar. -You were here three or four years ago. You were. Hopefully, there's plenty of new stock for you by now, Charles. These are quite sweet. Let me hold one. -And I think these are cut, aren't they? If they were moulded, they'd be quite smooth and not so crisp. On my collar here, a very clear hallmark, which is for Birmingham. And the date code, I suspect, is probably 1910, 1912. They're probably George V. One is slightly bigger than the other one. so they are a pair, which is great to see. That's a pair of perfume bottles for a ticket price of £125. I will earmark these as a definitely-maybe. -Yes, absolutely, I'll pop them on the counter for you. -And then come back to them. But there's so much to see here in your shop. -I'm going to wander on. Charles looks like he's going to get stuck in this morning. This is a lovely mahogany box. On the inside, it's pine. a flame mahogany two-section tea caddy, circa 1890. In fact, it's more like 1790. And of course, tea, back in 1790, was very expensive. Tea was kept under lock and key, to keep the butler out. but a Georgian tea caddy for £14. a piece of timber that has come off something perhaps ecclesiastical. This big, heavily carved piece of yew, that is probably circa 1600. I really think it's that early. And it could be £65. But next to it is this. All we know is it's £85. But it certainly is African and it's well-carved, with great colour. You could almost eat off it. And that stool really has legs. Hey, he's unearthing a lot in here. And it's just so different. is the gold specks within the actual glass body. is a fairly conservative retail price. Importantly, has it got a good ring? Yes, it has! It's lovely. Again, I might go and query that, alongside the stools, with Laura. I think Laura's got a calculator. Let's start with the bowl. ..at what he paid for it. -And he'll do that for you at £40. -So, at cost price. Wowee, that's good! Have you got a pen? May I borrow a pen and paper? -You need to start writing some notes. -My mind can go a bit blank. and £40 for the African tribal fellow. -£10 for the tea caddy and knocks £55 off the scent bottles. I need to lie down. I've got a sweat on. I've got a sweat on! That leaves Charles staring at a generous £174 discount. And I will say for £190, I'm going, going, gone. -Thank you so much, Laura. Thank you so much! -Hey, a huge haul for £190. -See you, Laura. Take care. Bye! Keeps on kissing hands. What a charmer! Oh, dear! I feel a bit dizzy now. Take care. And no wonder. Top work, Charles! to learn about one of the most popular men in Victorian Britain. and interacted with poetry forever. In this corner, we've got the books that Tennyson grew up with. -This is his father's library, which was in Somersby. Tennyson was born in 1809, he was one of 11 children born in 13 years. and his brothers with a classical education. I've got a book here that I can show you. that his father set him to do. -He made comments all the time. and this is probably his teenage work. in Europe, in the world, in the air, in space! So, he's got a bit of attitude, hasn't he? But life in the rectory wasn't always a happy place. to have been prone to alcoholism and violence. with his brothers, before leaving home for Cambridge University. like-minded but who had a very different background to him. So, they're urbane, sophisticated, well travelled. But they really enjoyed what he was writing. and very supportive of his creativity. Tennyson was hit hard by grief. that would last 15 years and result in one of his most celebrated works. Published in 1850, his work became an instant success. thanks in part to the support of Prince Albert. asking him to write his name in his copy of Idylls of the King. He actually sends him his copy of Idylls of the King. -He's not asking for a signed copy. Yes and he says, "You'll add a peculiar value to this book." So, it's a very interesting autograph request, I think. Tennyson was now a voice of the people. British cavalry headlong into the Russian troops with heavy losses. The resulting poem was The Charge Of The Light Brigade. -Is that his original draft? because it's got the writing of his wife, as well as his own writing. He says it was written after reading the first report of The Times. in the newspaper just weeks after the tragic event. "Forward, the Light Brigade!" Was there a man dismay'd? It helped shape public perception of the entire war. It was so successful that soldiers took copies of it with them to war. and influential men in the country, via poetry. a poet could be in those days. able to use to describe what was going on in their lives. it was followed in the newspapers. "Last medicine drop glass used by him and for him." And that's the date of his death, October 6th, 1892. And in here, is the handkerchief which covered the dear face. And that was put on his face when he died. -And this is meant to be the book that was in his hands when he died. open on his deathbed, in his hands. So, to the very end, he was reading. That was what they wanted to portray. and his immortal lines continue for generations to appreciate. in a place called Gainsborough. it is now home to what claims to be Europe's largest antiques centre. There's some wonderful things, it's just where to start. But what I'm really after is that object which just speaks history. It'll be here. It will be here. Perhaps some help from Diane will keep you on track. -that's quite a sweet thing, isn't it? But it's almost like what I would call a toasting glass. Don't you agree? It's got quite a heavy base. -I shall make an announcement. you are a fine lady. And that's almost what it was. air twists and other wine glasses of the period. It is a lead glass. I would say it dates to around 1780, and it's £23. made, let's say, 10 years before the French Revolution? There we go, that's really good. -Could I reserve it for a wee while? And then just possibly come back and make an announcement. Well, we'll wait with bated breath then. Oh, look, Margie has arrived. for this leg. But gosh, look at it. Yes, with six lots tucked away, there's no pressure. But you never know what you might find, Margie. Hold on, can I help you at all? -How's your day been so far? -Not too bad. How's your day been? Isn't it amazing? You know this is one of four buildings? Don't be silly, course there isn't! Why are you always teasing me? -It's huge, this building is huge. -You're trying to put me off. Get out of here, Margie Cooper! See you later. -Yes, there are. There are three more buildings. This is quite a good place. Crikey, you could get lost in here. Must be from the school, mustn't it? It's quite nice having them numbered though. Put that in a kitchen. Maybe a friend for your gnome. So convincing, but they are brand new. so if you can find your way out, perhaps you should leave it at that. it could be an 18th-century glass. "Victorian double-air twist-stem ale glass." than the rim of the bowl - or it's a very good guideline. So I'm happy that's 18th century. It's actually quite heavy. Lead glass, not soda. Actually, I quite like that. -Got to be careful. It's got a big chip there. Can you see? Priced at £58. What could be the best on that? -Would you round it off to 70? Never mind, Charles, nice try. I'll take them. Two together. Yeah, put it there. Thank you very much, Diana. Fine. Thank you. The old Hanson charm never wanes. Two glasses for £73 rounds off our shopping. And what a spree it's been. and a collection of First World War postcards. and a Victorian wine glass. What do they think of each other's purchases? If I was a gambling man, I would say, "Go, Hanson, go!" But, Margie, you never know. and I do like very much her table and her silverware. Yes, I'm quietly confident tomorrow that I will make small profits. And I'm not that worried about his. Apart from maybe that stool, the African stool. They can be a worry. So hopefully that all goes wrong for him. up and around Lincolnshire and ending this leg at an auction in Lincoln. -Margie, I honestly can't believe how misty it is. Many years ago at school, I had a maths teacher called Mr Misty. Maybe there's a formula there. -Maybe Charles x Margie = profit all around. at Unique Auctions in Lincoln. Come on, follow your lion. I'll follow this one. Margie spent £159 on six lots. Charles also picked up six lots for £268. to the auction and has been given an insurance valuation of £50. but Charles does get a £10 profit to start him off. What does auctioneer Terence Woodcock make of the remaining items? Postcards, very speculative lot, the postcards. They could do £30. They could to £80. The toasting glass is an early-Georgian toasting glass. The hair-twist wine glass. Very nice. Could be between £60 to £80. We'll soon find out. It's time to take your seats. The auction is about to start. Our first lot of the day is Margie's silver sweetmeat dish. 20 I've got there. 25. 30. 35. 40, fresh bid. At 45. -At 50, I'll take five now. At £50, have you all done? I'm selling, the second row. Is it fish? Margie, Margie, like a flying fish, you have flown. but that's a decent profit to get you started. The day has started well. Well, surely you can be optimistic about your silver hand mirror. £40 straight in. At £40. I'll take five now. 50 now. At 55, have you all done? That's all it's worth in that condition. Charles's first purchase is up, the cut glass perfume bottles. Lovely. You'll get...maybe get your money back. -Who'll start me at £100 the pair? -Come on, 30. 30 I've got there. -I'm in trouble, come on, let's go. Let the man do his job, Charles. 40 I've got there. 40. At 45. At 55 I've got there. 55, I'm looking for 60 I've got. At 60, I'll take five. Now 65 in the front. I'm looking for 70 now. At 65 I sell. That's a small loss. But there's plenty of time to make that back. -How often do you make a loss? Margie, it could be a big one loss today, I tell you. Can Margie fare any better with her First World War postcards? 50 straight in. 50 I've got there. At £50. I'll take five now. At 55, straight in at 55. I'll take 60. 60, fresh bid. At £60 in the room, I'll take five. Marge, I'm in the bunker. I'm staying in the bunker, I'm not coming out yet. 70 back in. At 75, 75, 80. 80, I'm looking for five. 85. Margie, you know what, sometimes there is an escape to victory. And I'm going to salute you. I sell to the gentleman at £85. and a cracking profit for Margie. Well done. Hold on, Margie. I'm surrendering now. and your sugar box and tea caddy could just get you back in the game. Straight in at 10, 12, 14, 16, 18. -I need some help now. -Get the caddy out, man. -28, £30. At £30, are you all done? It's in the doorway at 30, and I sell at £30. Doubling his money. This could be the start of a comeback for Mr Hanson. The rollercoaster is now at the big dipper and I'm about to come down. I thought we were supposed to be going up, not down. That's it, Margie, going up. but will there be a brawl in the sale room for Margie's gnome? Who'll start me at £50 on the garden gnome? -£30 on the garden gnome? 10 on the garden gnome? Thank you, sir. At 12, 14, 16, 18, 20, 22. £30. At £30, £30 still in the doorway. -At £30. £30 it is. Have you all done? but that's still a great profit. A chance for Charles to claw back with his two glasses. -I'm expecting this to make 100. -And 35, 45, 50, 55. -Come on, let's move, come on. The little twist one used to make 200. -Absolutely. Come on, let's go. -At 65. At 65 and I sell now at £65. That's an amazing price for two glasses that are over 200 years old. -Oh, dear, I don't know what to say. Yeah, we feel your sympathy, Margie. Time for your document trunk. 30 I've got. At £30. -Profit? Is that a profit? -At £30, are we all done? What's wrong with this? 35, thank you. 40 with the original bidder. 45, I'll take 50 now. at 45, but there you are. That's another good profit and edges Margie further into the lead. Time for the first of Charles's wooden stools. 20 I've got there. At £20. 30. 35. 38, thank you. I'll take one if it will help. I'll tell you the provenance afterwards. 41. I'll tell you as well. 42. -When the going gets tough, squeeze a bit. Now, after what I've done, you've got to go 46. 46. We could be up to 200 in a minute. Good lad. I like your style. Stylish work from Terence and a profit for Charles. but will it come back to haunt her? because it's my lucky day, isn't it? I've got the lady at 20, 25 straight in. I'll take 30 now, at £30. 35, 35, I'll take 40. £40 I've got. At £40 now. At £40, come on now, at £40. At 50. Have you all done, at £50? -Made a profit all day. That nice little profit seals a 100% record on the day. Something special is about to happen. I can feel it. and the last chance to catch Margie today. -50 I've got, thank you. At £50 now. -Need to run a bit here. 65, fresh bid. At 65. 70. At 70. I'll take two if it will help. 70 I've got. Back in, 72. 75, I'm looking for now. No, at 72 and I sell. At 72. -That's our game over, Margie. That's a good profit, but was it enough? Time to find out. Give me a high five. Margie, give me a high five. There we go. Keep going, get out of here. giving him a total of £545.98p. Margie had £325.74p at the start of this leg. After auction costs, she racked up a fantastic profit of £99.30p. going into the final leg. -What a turn-up for the books. -I don't know what to say, Margie. -Let's just go for it. I'm going to take a chance. ..Charles walks all over the competition. The last thing I want is Hanson on stilts. 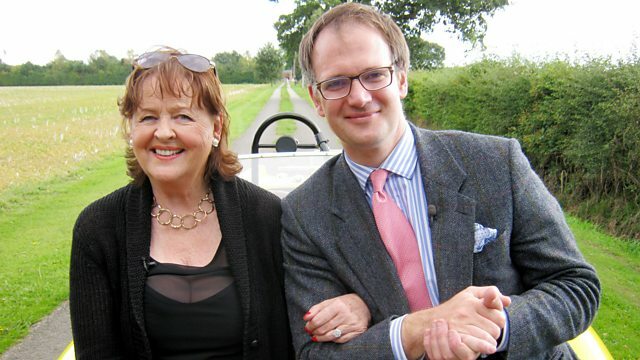 In their penultimate leg, Charles Hanson and Margie Cooper start off in Nottingham and make their way towards an auction in Lincoln.